West Chester University football (1- 2, 0-0 PSAC East) found themselves entangled in a high-scoring affair with the Edinboro Fighting Scots (3-0, 0-0 PSAC West) inside of Sox Harrison Stadium on the afternoon of Saturday, Sept. 17, and despite their gallant efforts to mount a huge comeback, the Golden Rams were unable to eek out a victory as they fell 54-51 in overtime. After an Andrew Derr touchdown pass to Jordan Banks knotted things up midway through the first quarter, Edinoboro’s offensive attack began to gain traction as the Fighting Scots scored on three consecutive possessions, which included two touchdowns. Meanwhile WCU’s offense remained mum, and their defense was deafened by Edinoboro’s boisterous attack. West Chester trailed Edinboro 24-7 at halftime, but began to show life in the second half as Jarel Elder recorded a 44-yard rushing touchdown late in the third, and B. Paulison nailed a 37-yard field goal after an 11-play, 70- yard drive. Paulison’s score was succeeded by a 28-yard touchdown pass Edinboro quarterback Jake Sisson lofted to James Clark at the 10:23 mark of the fourth quarter, increasing the Rams’ deficit to 14. But Elder struck again, this time on an 80-yard just a mere 17 seconds after Clark corralled his TD catch. West Chester and Edinboro then exchanged field goals which made the score 34-27 in the Fighting Scots’ favor, and a Walter Fletcher TD reception from Sisson with 4:30 left in the final frame boosted the score to a seemingly insurmountable 41-27. WCU, however, had other plans, as Derr reeled off two consecutive touchdown passes to Marcus Sydnor to tie the game at 41 apiece. WCU defensive back Ted Patton then intercepted Sisson with under a minute left. The Rams then marched to Edinboro’s 6-yard line, but Paulison shanked a 30-yard, game-winning field goal with 12 seconds left, which set the stage for overtime. Edinoboro drew first blood in OT, as Sisson hit Alex Caratelli for a TD pass, but Derr immediately issued a rebuttal, heaving a touchdown strike to Tyler Karpinski which again tied matters up. After an unsuccessful scoring attempt from Edinoboro, West Chester had a chance to secure a victory, but they only managed to walk away with their first lead of the contest as Paulison hit a 25-yard field goal to tilt things in the Rams’ favor 54-51. West Chester’s once bleak outlook had been supplanted by a radiating hope, but the completion of the comeback was thwarted as Sisson threw a 16-yard game-winning dart to Caratelli to give Edinoboro a 54-51 lead. Derr, who engineered WCU’s valiant comeback effort, had a career outing, going for 559 yards and four touchdowns on 39-of-70. He also threw four interceptions, but broke school single-game records for passes completed, attempted and yards. He also established a new WCU single-game high for total offense, as he accounted 563 yards individually. Elder led the ground-game, finishing with 193 yards and two touchdowns on 22 attempts, and he recorded his second 100-yard game of the season and fourth of his career, with 183 of his yards in this contest coming after halftime, including an 80-yard TD trek. Karpinski headed up the reception department, ending the game with a career-high nine catches for 178 yards and one crucial overtime touchdown. Syndor finished with four receptions, 84 yards and two touchdowns, while Banks reeled in six catches for 84 yards and one touchdown. Lex Rosario (four receptions, 69 yards), Brandon Kuntz (five catches, 53 yards), and Eerin Young (five receptions, 43 yards) also made significant catching contributions. One thing WCU can find solace is the fact that Derr does an excellent job of equal distribution, forcing opposing defenses to honor all of WCU’s offensive threats. Kavon Johnson and John Dubyk both recorded sacks for the Golden Rams, while West Chester improved on their protective measures from last week as Edinoboro was only able to sack Derr once. WCU trumped Edinoboro in almost every major metric, as they had more rushing yards (199-60), passing yards (559-289), and total offense (758-349). The Rams also controlled the ball more than the Fighting Scots (33:26- 26:24), but they were unable to convert when it counted. West Chester was 9-of-20 on 3rd down conversions, but they failed to extend their drive on 4th down twice, going 0-of- 2 in 4th down scenarios. 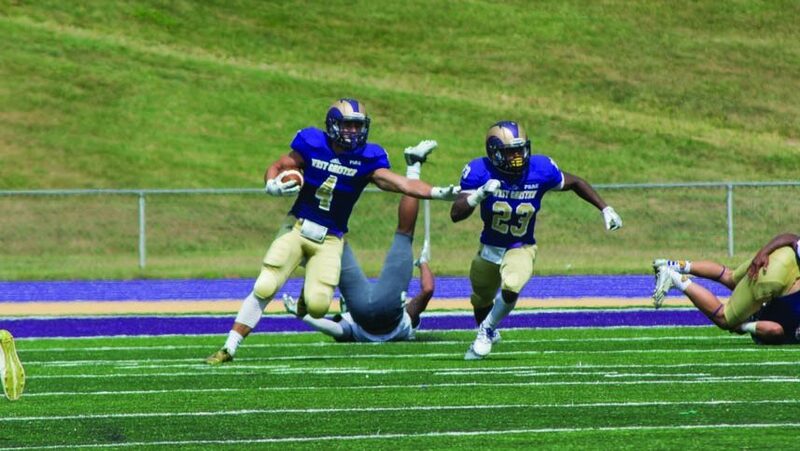 WCU has to improve defensively going into next week. Defense is what wins, and West Chester must be able to rely on theirs. West Chester’s next game will be on Family Day (Saturday, Sept. 24) against Lock Haven University inside of Farrell Stadium, and will mark the commencement of PSAC play for the Golden Rams. Be prepared to gather up the family and voyage to Farrell to cheer on your Rams as they look to snap their two-game skid.